Astronomers analyzing nearly 20 years of data from the National Science Foundation's Very Large Array radio telescope have discovered that a small star in a multiple-star system in the constellation Taurus probably has been ejected from the system after a close encounter with one of the system's more-massive components, presumed to be a compact double star. This is the first time any such event has been observed. "Our analysis shows a drastic change in the orbit of this young star after it made a close approach to another object in the system," said Luis Rodriguez of the Institute of Astronomy of the National Autonomous University of Mexico (UNAM). "The young star was accelerated to a large velocity by the close approach, and certainly now is in a very different, more remote orbit, and may even completely escape its companions," said Laurent Loinard, leader of the research team that also included Monica Rodriguez in addition to Luis Rodriguez. The UNAM astronomers presented their findings at the American Astronomical Society's meeting in Seattle, WA. The discovery of this chaotic event will be important for advancing our understanding of classical dynamic astronomy and of how stars evolve, including possibly providing an explanation for the production of the mysterious "brown dwarfs," the astronomers said. The scientists analyzed VLA observations of T Tauri, a multiple system of young stars some 450 light-years from Earth. The observations were made from 1983 to 2001. 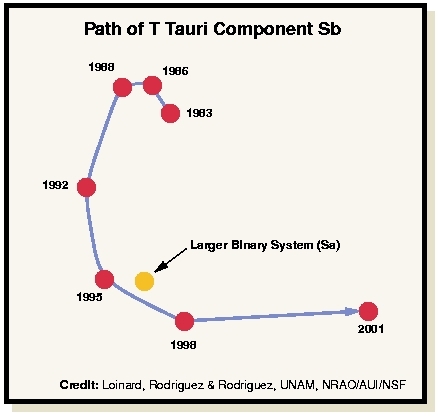 The T Tauri system includes a "Northern" star, the famous star that gives its name to the class of young visible stars, and a "Southern" system of stars, all orbiting each other. The VLA data were used to track the orbit of the smaller Southern star around the larger Southern object, presumed to be a pair of stars orbiting each other closely. The astronomers' plot of the smaller star's orbit shows that it followed an apparently elliptical orbit around its twin companions, moving at about 6 miles per second. Then, between 1995 and 1998, it came within about 200 million miles (about two times the distance between the Sun and the Earth) of its companions. Following that encounter, it changed its path, moving away from its companion at about 12 miles per second, double its previous speed. "We clearly see that this star's orbit has changed dramatically after the encounter with its larger companions," said Luis Rodriguez. "By watching over the next five years or so, we should be able to tell if it will escape completely," he added. "We are very lucky to have been able to observe this event," said Loinard. Though studies with computer simulations long have shown that such close approaches and stellar ejections are likely, the time scales for these events in the real Universe are long -- thousands of years. The chance to study an actual ejection of a star from a multiple system can provide a critical test for the dynamical theories. If a young star is ejected from the system in which it was born, it would be cut off from the supply of gas and dust it needs to gain more mass, and thus its development would be abruptly halted. This process, the astronomers explain, could provide an explanation for the very-low-mass "failed stars" called brown dwarfs. "A brown dwarf could have had its growth stopped by being ejected from its parent system," Loinard said. The VLA observations were made at radio frequencies of 8 and 15 GHz. 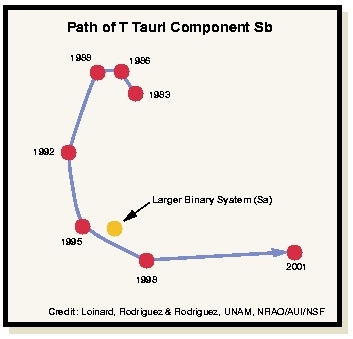 T Tauri, the "Northern" star in this system, is a famous variable star, discovered in October of 1852 by J.R. Hind, a London astronomer using a 7-inch diameter telescope. At its brightest, it is some 40 times brighter than when at its faintest. It has been studied extensively as a nearby example of a young stellar system. While readily accessible with a small telescope, it is not visible to the naked eye. The observed orbital changes took place in the southern components of the system, displaced from the visible star by about one hundred times the distance between the Sun and the Earth.